Few predicted how important this 2011 draft pick by Golden State would be. In the age of superteams and super-duper teams,1 the Golden State Warriors built the ultimate doomsday machine when they added Kevin Durant in free agency last summer. Winning a championship this year seemed — and ultimately was — inevitable. But before KD put pen to paper, Golden State had captured one title and set the all-time wins record. And it was done with a roster largely built through the draft. The Warriors were the poster children for how to build a team through savvy scouting and player development, not reckless spending. Likewise, we can make a pretty good guess that the team that one day unseats Golden State will not be a creaky monument to Russian oligarchy, but rather more organic. So on draft day, let’s imagine how a team might build through the draft, stockpiling young talent and maxing out their collective potential. Could such a team rise to the Warriors’ level? Maybe. But everything would have to go right for our team, from lucking out in the lottery to nailing its picks and then developing them into stars. In other words, to beat the Warriors, you have to do what the Warriors did. First things first: It isn’t easy to jam-pack a roster with a bunch of promising young players. Even an aggressive tanking effort like Sam Hinkie’s “Process” in Philadelphia can’t guarantee that the lottery balls will fall the way they’re expected to. Indeed, the Sixers under Hinkie suffered below-average lottery luck. Meanwhile, other teams can always swoop in and snag the top pick (think the Cavaliers). Although Philly still managed to draft some high picks over the years — including, finally, a No. 1 choice in Ben Simmons last year — it didn’t get as much out of the draft as its fans might have expected when the Process began. Early in the draft, the curve is steep. The average No. 2 pick is worth only about 80 percent as many VORP in his first five seasons as the average No. 1, and players only get less valuable from there. Each additional pick produces a lot less than the slot before, emphasizing how costly every random tumble in the lottery can be. But let’s say our theoretical team gets its hands on a collection of valuable draft picks. What are the odds that it will take the right player at each slot? According to my research, there’s about a 70 percent chance that a team won’t take the best player available with any given pick at or near the top of the draft. Of course, the haul is still usually decent even if a team doesn’t nail its pick perfectly — but at the same time, “decent” doesn’t really help build a Warriors-killer. * Value Over Replacement Player. Based on draftees’ first five NBA seasons, versus the average expected VORP for the slot where each player was picked. Players who were traded at the draft are assigned to the team that acquired them. And this methodology probably underrates the drafting job done by former Warriors general manager Larry Riley — and his replacement, Bob Myers, who made the team’s best pick when he drafted Draymond Green 35th overall in 2012 — since it looks at only the first five seasons of a player’s career. Curry, for instance, didn’t reach his full game-breaking potential until his sixth season in the league. 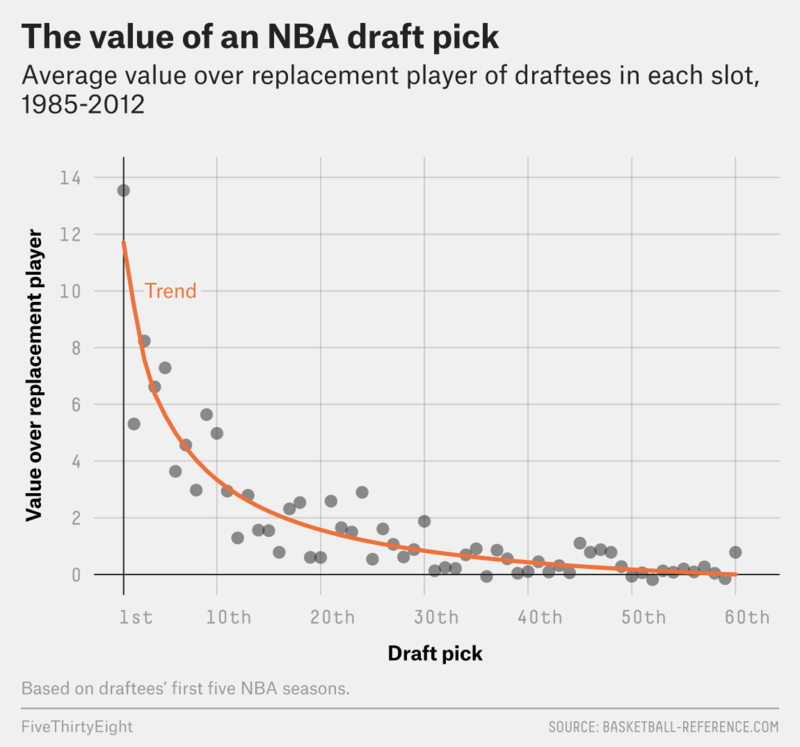 But just as studies have found in other sports (most notably the NFL), there isn’t much consistent skill to making better-than-average picks in the NBA draft. The correlation between a team’s per-pick return on investment2 in one three-year period and the next is only 0.014 — a practically nonexistent relationship.3 Even the Warriors picked big-man bust Ekpe Udoh sixth overall in between the first rounds in which they snapped up Curry and Thompson. With all these factors stacked against teams built around touted draft picks, it’s no wonder they have a spotty record of converting potential to results. Using the same method of evaluating talent bases as my colleague Kyle Wagner and I created for this story about the Minnesota Timberwolves, I measured how many highly drafted young players each team4 had on its roster at the same time. I then built a model using that data to predict how a team might fare over the next five seasons based on its young talent. For most teams in recent history, it’s tough to see much of a relationship between young talent and how much the team’s Elo rating5 improved, above and beyond what we’d simply expect from ordinary reversion to the mean. Only at the most extreme edge of young talent, where the sample of historical examples is limited, do we see the potential upside usually associated with a group of highly drafted prospects playing together. (Think of the 2009-10 Oklahoma City Thunder, one of the greatest collections of pure talent ever assembled, coalescing into an NBA finalist within a few seasons.) Short of that, it’s tough to improve more than normal reversion to the mean would predict by simply stocking up on a bunch of kids with raw draft pedigree. Future stardom is unpredictable (again, see teams’ lack of consistency in getting better-than-average return on picks), and young players in particular tend to amplify one another’s flaws when playing together. 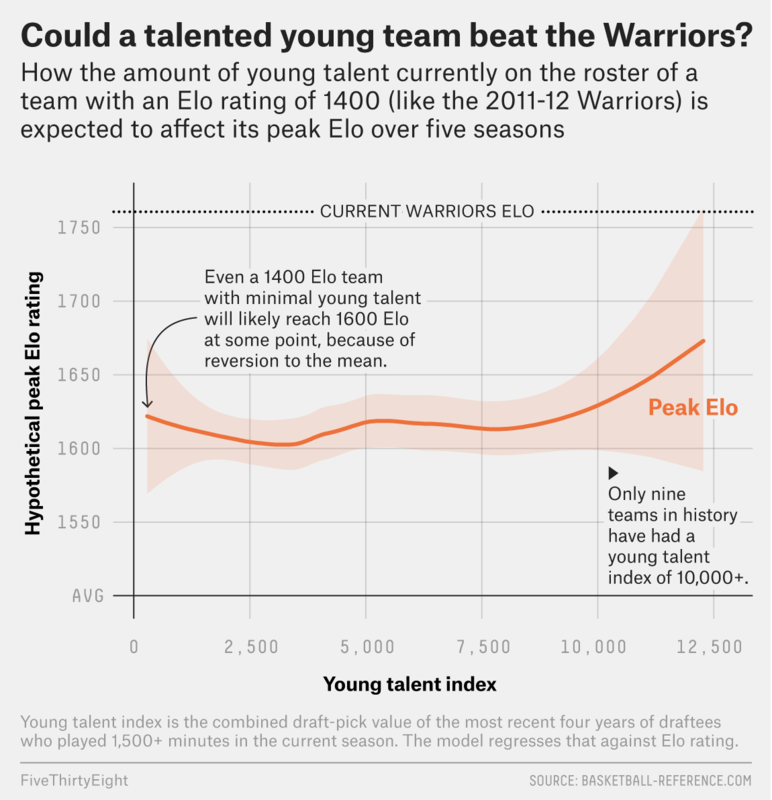 But if our hypothetical Warriors-killer does manage to survive the lottery, make the right picks in the draft, get those prospects on the court together and then max out their potential, the model predicts the upper bound for its eventual peak Elo would be 1762. That’s roughly where the Warriors will be starting from next season (after reverting their final 2016-17 rating to the mean), and it’s also roughly the same Elo carried at season’s end by the 2015-16 Cleveland Cavaliers — not coincidentally, the last team to unseat the Warriors in the playoffs. A lot has to go right to get to that point, and most teams who travel down that path will fall short. But the Warriors will also feel the tug of parity soon — however gently — and at the same time, some team will eventually clear all the hurdles and build the challenger to Golden State’s throne. There’s a decent chance that journey starts in Brooklyn tonight, at the draft. Whether today’s stars want to admit such things exist or not. As measured by VORP over expectation for each draft slot. I used three years because that’s about half the reasonable lifespan of an NBA GM gig. Going back to the start of the NBA’s modern expansion wave in 1988-89. Essentially, FiveThirtyEight’s way of measuring how well a team is playing.